And note the silver pen, which surely = True Love Always. Also note my random use of semicolons, which clearly I had no idea how to use. The pic: Homecoming Dance 1984. The guy next to me was neither my date nor Brad (although I do like how he gave me a shout-out when he signed my yearbook). My date was the poor guy standing behind me…also not Brad. The one I want so. 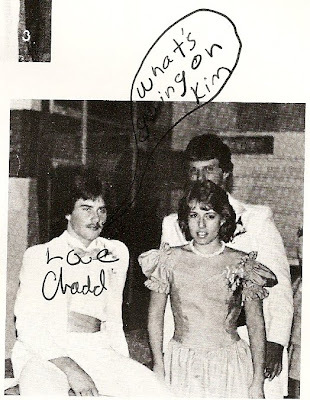 I like how everyone in your high school was named Brad or Chad. I'm sorry: Chadd. I'm going to write a love poem about his mustache. I think my sister had the exact same dress for prom!! And I love how that pen actually scanned glittery!! Again I say, you are so brave!! I love these flashbacks! 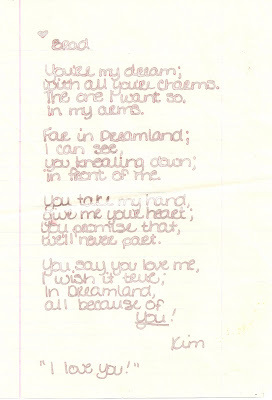 :) Sometimes I'll come across some of my old poetry. Boy was I dramatic. Haha.